Junior Conservatory Visual Arts students enjoy the new upper level Visual Arts classroom and studio space in the Conservatory building. 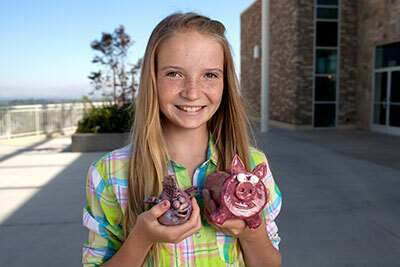 With a dedicated Junior High room, the teachers provide inspiration and instruction in art, ceramics, and photography. In the Art Foundations class, students learn about the elements of art and how each plays a part in the foundation of all artwork. Various mediums including pencil, paper, canvas, acrylics, and block prints are explored. The class includes the study of different time periods and artists of those eras. The Junior High Photo class is an introductory course. Students explore different buttons and settings of their cameras, and photograph projects that will use those functions. They also learn the composition of a photograph from the artistic aspect. After exploring elements and principles of art in relation to photography, they take photos defining each one. Students will also be introduced to basic functions of Photoshop CS5.